The U.S. House of Representatives leadership’s failure to mete out real consequences when Congresspersons spew vile antisemitism is sending a terrible message, which is encouraging more attacks on Israel and Jews. Everyone sees that Rep. Ilhan Omar (D-MN) is still sitting on the House Foreign Affairs Committee after she falsely called Israel “evil” and an “apartheid state” and supports BDS and falsely and hypocritically claimed that Jewish money buys Congress (while CAIR and BDS leaders fund Omar). Thus, Jew-haters now believe that they too can “get away with” hateful antisemitic public statements. A dramatic demonstration of the fruits of Speaker Nancy Pelosi’s and Congressional Democratic leaders’ failure to take concrete action against the antisemites in their midst occurred last week: The Chairman of the Arab-American Caucus of the Californian Democratic Party, Iyad Afalqa, posted vile comments on Facebook about Jewish Democratic Senator Chuck Schumer. 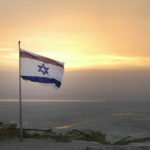 By way of background, during his recent speech at AIPAC, Senator Schumer stated that Democrats must call out people who say Jewish-Americans who support Israel are “not loyal to America.” Senator Schumer did not even mention Congresswoman Ilhan Omar’s name when he condemned her “dual loyalty” attack on the Jewish people. Speaker Pelosi and the Democratic leadership need to wake up to the antisemitic poison that is spreading throughout the country and throughout their party, emboldened by their failure to take concrete action against Israel-haters and Jew-bashers in Congress. This situation seems likely to become even worse if Speaker Pelosi continues to support Congresspersons such as Ilhan Omar; Rashida Tlaib (who cavorts with anti Israel terrorists, supports BDS and replaced Israel with “Palestine” on her Congressional map and celebrated her election victory by wrapping herself in the “Palestinian” flag and embracing a vicious Hezbollah promoter); Alexandria Ocasio-Cortez (who supports BDS and is a leader of the Democratic Socialist Party which supports Israel’s destruction and who falsely condemned Israel for “massacring” Gazan “protestors” – when in fact Hamas and Palestinian Islamic Jihad admitted that 53 out of 61 fatalities in May were their militants), and Hank Johnson (who called Jews living in Judea/Samaria “termites”). 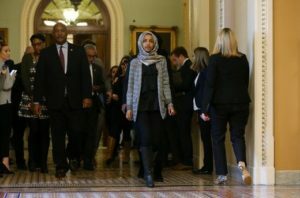 ZOA thus once again urges Speaker Pelosi to remove Ilhan Omar from the House Foreign Relations Committee, and to remove all those who spew antisemitism from Congressional committees.